In this tutorial we will develop an application to show you how to move from one activity to another in an Android application. 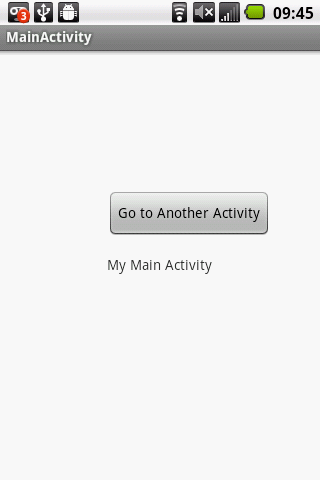 The picture above shows you the first screen that is seen when the application is launched, it is composed of a button used to go to the other activity, which we will call “SecondActivity”. 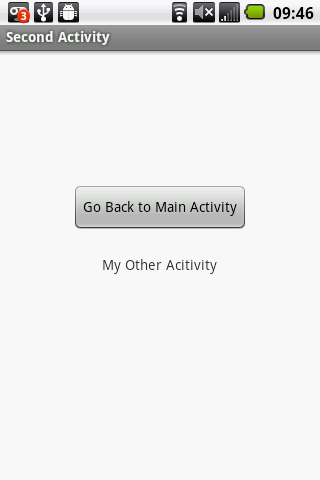 The second activity, shown below, will have its own button, this button will be used to go back to the previous (first) activity although you could also use the phone’s back button. The startActivity method is used to move from one activity to another, it takes a parameter of type Intent. The Intent object requires a context and class parameters, the context parameter is simply the object of the activity that will trigger the startActivity method, and the class is the the activity you want to go to. Before we can tell Android to start an activity we have to add some files as well as modify others. What we need to create is a java and layout xml file for each new activity,the java file is the activity’s functionality code, the xml file is the layout file. Eclipse already created a java and layout file for the main activity when you created the project. Both of our activities have a button an onclick listener for that button, when the button is clicked the startActivity method with its Intent is called. The full code for the application is given below.